Stamp with Me: Melbourne here we come! Missed yesterday. Sometimes life keeps you very busy! I had a special day with Big Boy Luke yesterday while the two of us ran errands. He is so growing up and I can see how ready he is getting for big school next year. Amazing to think we're heading towards the last term of preschool next week. 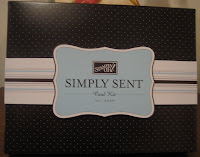 I received my Simply Sent™ Card Kit in the mail today. Aren't they lovely! Have you got yours? These kits are 20% off this week to celebrate World Card Making Day. This offer is on until 11th October 2008 - contact me if you want your own lovely kit. Don't miss out! They come in this beautifully presented box and when you open it up - it is full of goodies. Packed full! 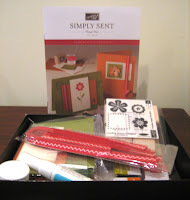 I love it :) The kit contains everything you need to make at least a dozen cards. This will be the perfect kit to take down to Melbourne when I head that way tomorrow with my two boys (my wonderful husband has to stay behind and work). I hope to show all my friends and family! I'm not sure how many posts I'll be able to do this week - so I'll just have to save it all up for when I get back from Melbourne. I'm very excited as is Big Boy Luke!